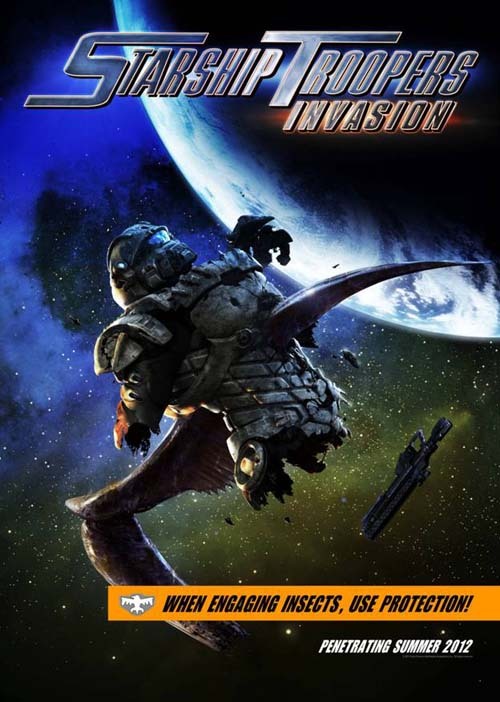 Here comes a new anime movie called Starship Trooper: Invasion. A distant Federation outpost, Fort Casey, comes under attack by bugs. The team on the fast attack ship Alesia is assigned to help the Starship John A. Warden stationed in Fort Casey evacuate along with the survivors and bring military intelligence safely back to Earth. Carl Jenkins, now ministry of Paranormal Warfare, takes the starship on a clandestine mission before its rendezvous with the Alesia and goes missing in the nebula. Now, the battle-hardened troopers are charged with a rescue mission that may lead to a much more sinister consequence than they ever could have imagined…. Shinji Aramaki is director. Known for his action direction, Aramaki was the chap behind APPLESEED. As as a production designer designing futuristic mechs, he started his career with the anime title ROBOTECH as the mechanical designer, followed by various titles as production designer. The list includes DIGIMON TAMERS (2001), ASTRO BOY (2003), WOLF’S RAIN (2003), NARUTO the Movie: Ninja Clash in the Land of Snow(2004), MOBILE SUIT GUNDAM MS IGLOO(2004), BUBBLEGUM CRISIS (1987), FULLMETAL ALCHEMIST (2003), FULLMETAL ALCHEMIST the Movie: Conqueror of Shamballa (2005), and SOUL EATER (2008).